Cornell's Lyme Multiplex assay provides a unique tool to determine the stage of Lyme disease infection, treatment outcomes, and vaccination status in dogs and horses. 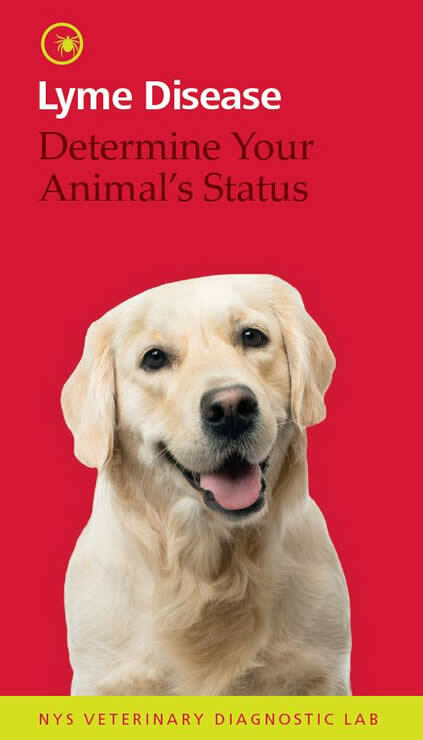 This fully quantitative test is only available at Cornell University through the NYS Veterinary Diagnostic Laboratory. Lyme disease is caused by infection with the bacterium Borrelia burgdorferi. The bacteria are transmitted to humans and animals through the bite of infected blacklegged ticks, such as deer ticks. Dogs can display several forms of Lyme disease, but the most common symptoms are lameness, swollen lymph nodes, joint swelling, fatigue, and loss of appetite. In addition, serious kidney complications have been associated with Lyme disease in dogs. Clinical signs of Lyme disease in horses include shifting-leg lameness, generalized stiffness, hypersensitivity to touch, weight loss, and poor performance. Sometimes, the bacteria can infect the central nervous system, leading to neurologic symptoms. When do clinical signs of Lyme disease occur? Only 5-10% of infected animals are expected to show clinical signs of Lyme disease. These signs typically occur at the chronic disease stage and as early as 2-5 months after infections, although it is possible for signs to develop much later. Your veterinarian will observe your animal in order to confirm clinical signs of disease. If clinical signs correspond to Lyme disease, your veterinarian will order a serologic test such as the Lyme Multiplex assay. Tick control and prevention methods significantly reduce the likelihood of infection. Maintaining antibodies against B. burgdorferi through vaccination can further protect your animal. Antibody amounts and duration of vaccine antibodies can vary in individuals. Verifying your animal’s antibody response to vaccination helps to assure durable protection. Antibodies are proteins produced by an animal’s immune system in response to a foreign substance such as bacteria or viruses. Antibodies recognize and bind to the bacteria and help to eliminate the infection. What does the Lyme Multiplex assay measure? The Lyme Multiplex assay quantifies antibodies directed against specific proteins on the surface of B. burgdorferi at three different stages of the bacterial life cycle. This antibody profile can indicate whether an animal has been recently infected or is chronically infected with B. burgdorferi. It can also be used to monitor protective antibodies after vaccination. How is the Lyme Multiplex assay different from the assay my veterinarian can perform? Your veterinarian can perform a quick assay in-house that checks for antibodies against only one B. burgdorferi surface protein. The in-house assay cannot detect early infection, cannot determine vaccination status, and does not quantify the amount of antibodies your animal is producing. Quantifying antibodies is an important measure for successful treatment and to confirm cure from Lyme disease. If my animal is positive on the assay, should he/she be treated for Lyme disease? If your animal is displaying clinical signs of Lyme disease and is positive on the Lyme Multiplex assay, it is advisable to discuss treatment options with your veterinarian. If your animal appears healthy, discuss the risks and benefits of treatment and develop a monitoring plan with your veterinarian. How can we know treatment was successful? If your animal is successfully treated, antibody levels will decrease by 40% or more after 6-8 weeks if it is in the early stage of infection, or after 3 months if the infection is in the chronic stage. Can an animal on treatment get re-infected? Yes, infected ticks can also feed on animals while they are being treated. However, the ongoing treatment will likely prevent re-infection. Can my animal get infected despite being vaccinated? Yes. Some animals have been infected despite vaccination. The most common reasons are low or short-lasting vaccine antibodies in the individual animal. It is advisable to monitor the vaccine response annually to ensure the animal develops sufficient antibodies in response to vaccination. Vaccine antibodies can be quantified with the Lyme Multiplex assay as early as two weeks following vaccination or anytime afterwards. Does Lyme disease treatment with antibiotics affect antibody levels? Antibiotic treatment affects the pathogen (B. burgdorferi). It does not directly influence antibody titers. However, if the treatment is successful and bacteria are removed from the host, the B-cells are not further triggered to produce new antibodies. As a consequence antibodies levels decrease after treatment. Thus, antibody levels are indicators of treatment success (or failure). How long after treatment should the horse/dog be re-tested? Antibodies decrease slowly but gradually after the pathogen is cleared from the host’s circulation. Re-testing should not be performed too early. For horses/dogs with positive values for antibodies to OspF but negative values for antibodies to OspC (OspC-/OspF+), retesting should be done 3 months after the treatment was started. For horses with a positive OspC antibody value (OspC+/OspF- or OspC+/OspF+) retesting can be done 6-8 weeks after the treatment started. At the time of retesting, a decrease of antibody levels can be expected in successfully treated animals. Serum antibodies may not have completely disappeared at this time. However, they should have dropped by about 40% of the original positive value(s). If antibodies to Osp A are positive, but antibodies to Osp C and F are equivocal, what is recommended? Retest in 2-3 weeks. The pattern may indicate an early infection. If the horse/dog is truly infected, antibodies to Osp C and/or OspF will rise during that time. If an animal was antibody positive for Lyme and treated, then re-tested with no changes in Ab levels, what is recommended? Antibody titers can decline very slowly in some animals. If the animal shows clinical signs consistent with Lyme disease re-treating should be considered. It can also be indicated to switch to another antibiotic. If no clinical signs of Lyme disease are observed, different approaches can be tried: (1) A different antibiotic can be used, (2) treatment time can be extended, or (3) the animal is not treated again but its antibody status is monitored every 6-12 months (depending on risk of new infection). If no increase in antibody values occurs for option (3) and the animal is free of clinical signs no further treatment is recommended. Median Fluorescent Intensity; The Lyme multiplex assay is based on fluorescent detection technology. The values are expressed as MFIs. The higher the antibody concentration to B. burgdorferi is in the sample, the more light is emitted. This is reflected by higher MFI values. Highly positive sera reach values of 20,000 MFI or higher. Does Lyme Multiplex assay detect IgM or IgG? The Lyme Multiplex assay detects total antibody levels. The routine test does not distinguish between IgM and IgG. The pattern of antibodies to the different Osp antigens determines early or chronic infection. Can a tick carry other infectious organisms besides B. burgdorferi (Lyme) and cause a double infection? Yes, it can. The most common other organism is Anaplasma. Does treatment immediately after a tick bite negate signs of early infection? Not every tick carries B. burgdorferi. The infection rate of ticks also varies with geographic region. Therefore, treatment should not be performed based on a tick bite alone. If the tick was found on the animal it can be sent in for B. burgdorferi PCR. PCR for Anaplasma can be performed simultaneously if requested. If the tick was infected, early treatment can be considered. However, a tick must feed for at least 24 hours on an animal or human for B. burgdorferi transmission to occur. Only a serological test will confirm whether transmission of B. burgdorferi occurred and the animal was infected. Antibodies can be detected in infected animals as early as 3-4 weeks after infection. Lyme Multiplex testing is recommended after that time. Treatment can be initiated immediately afterwards if antibody levels are positive. Treatment during this early infection phase is generally very effective. How soon after infection can antibodies be detected with the Lyme Multiplex assay? As early as 3-4 weeks after infection depending on the tick load, the amount of bacteria per tick and the animal’s immune response. Can an animal get infected despite being vaccinated? Yes. This has been observed that some animals can still get infected after Lyme vaccination. This can be due to a low immune response of the respective animal and/or a very high exposure rate or Lyme prevalence in the area where the animal lives. A yearly check of the OspA titer is recommended for a vaccinated animal to ensure that the animal responded with high OspA antibodies to vaccination. Please indicate the name of the vaccine and when it has been last applied on the accession form. Which antibodies does the vaccine from Merial induce? It is a recombinant vaccine based on Osp A. Vaccinated animals should develop high antibody levels to OspA and maintain negative antibody levels to the remaining two antigens. Infected/non-infected animals can be identified based on OspC and OspF antibody values. Detection of the early Lyme infection stage is possible after using this vaccine. Which antibodies does the vaccine from Intervet (Merck) induce? This vaccine is based on recombinant OspA and OspC and is expected to induce antibodies to both of them. The use of this vaccine interferes with the detection of early Lyme infection in vaccinated animals. However, infected animals can still be identified based on OspF antibody values. Only 5-10% of infected animals are expected to show clinical signs of Lyme disease. They typically occur at the chronic disease stage and as early as 2-5 months after infection. Clinical signs can also develop much later. Do antibodies to B. burgdorferi determine active infection? In untreated animals, antibodies to OspC and/or OspF are indicators of infection with B. burgdorferi. Many infected animals don’t show clinical signs and maintain constant antibody levels to the pathogen. It is believed that many animals can control the persistent infection. However, increasing antibody values indicate re-activation of or re-infection with the pathogen. In treated animals, antibody levels decrease slowly and are usually still detectable for several months if treatment was successful. Can we test fluids other than serum? Yes, CSF samples can be submitted from horses with neurological signs. The CSF sample needs to be submitted together with a serum sample from the same animal and taken at the same time. The relative increase of antibodies in CSF can indicate local production of antibodies in the CNS. Typically, one or two antibody values (out of the three Osp values in the multiplex assay) are increased more than 2-fold if B. burgdorferi contributes to the neurologic condition. For other samples, contact the lab first (phone 607.253.3900). Yes, infected ticks can also feed on animals while they are treated. In this case, the treatment will likely prevent establishment of persistent infection. For animals that have not been vaccinated, can Osp A values be positive? How should this be interpreted? Antibodies to OspA have previously been interpreted as markers for vaccination. Non-vaccinated animals usually have low values for antibodies to OspA, while vaccinated animals develop these antibodies. OspA antibodies have been shown to protect from infection with B. burgdorferi. However, there is accumulating evidence that antibodies to OspA can occur without vaccination. First, residual OspA is present on the bacterial surface at the time of transmission to an animal. This causes a low and transient OspA antibody response early after infection. Second, antibodies to OspA have also been associated with treatment-resistant Lyme arthritis and with development of autoimmunity in human patients. Similarly, OspA antibodies in non-vaccinated dogs or horses can be considered as markers of chronicity and disease severity.